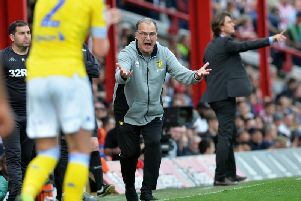 Rotherham United’s interest in Scott Wootton is on hold amid claims by manager Steve Evans that Leeds United owner Massimo Cellino blocked a deal to send him back to South Yorkshire. Evans revealed that Rotherham attempted to re-sign Wootton after the end of his recent loan but said Cellino had moved to prevent a transfer agreed with United head coach Neil Redfearn. Wootton is surplus to Redfearn’s first-team plans and the proposed signing of a new centre-back this month looked set to hasten the 23-year-old’s departure from Elland Road. The former Manchester United defender has a year-and-a-half on his contract but he has played only four times for Leeds this season. Evans, who signed Wootton on loan in November, said: “Scott was a young man we would have liked to have kept. That deal in principle was agreed with Neil Redfearn. “As we know, Redders is perhaps not subject to making the final decision. Mr Cellino, which he is entitled to – the same as our chairman would be – decided that was not to be the case. So we have to respect that and Scott Wootton has gone back to Leeds . Cellino was unavailable for comment.